Shutter Island (2010) is another worthy offering in this line. In fact given director Martin Scorsese’s mindfulness of movie history, it is not surprising that this film features more than a few references to some of those past works and directors. There are two interesting aspects or angles to this film: it’s narrative structure and the psychiatric theme, which I will discuss in turn. The story, which has several layers of paranoia-inspiring schemes, begins in 1954 with federal US Marshals Teddy Daniels and Chuck Aule on a patrol boat headed for Ashecliffe Hospital, an insane asylum on an Alcatraz-like island in Boston Harbor. The asylum houses the most incurable and dangerous lunatics in the country, and the two marshals have come to investigate the disappearance of a female inmate named Rachel Solando who has somehow vanished from the supposedly inescapable confinement. Anyway, early on in the film, we’re following along on narrative level number one: the two marshals are trying to find out what happened to Rachel Solando, who is said to have murdered her three young children but is now living in a dream world and believing that her children are still alive. Daniels and Aule are given free rein to explore the asylum by doctors Cawley (Ben Kingsley, in an eerily effective performance) and Sheehan (Max von Sydow), but they are warned not to go Ward C, where the most dangerous inmates are housed. So the narrative goal to be achieved is to find the potentially dangerous antagonist, Rachel Solando, and see what has happened to her. From the very outset there is a foreboding air of unreality about everything. On the boat, Daniels and Aule are shown in unnatural studio back-projection and artificial lighting – a cinematic technique that characterized Hollywood films of the 1950s, but which is conspicuously weird for a modern film. In addition, the cinematography includes awkward axis-crossing reverse shots and rapid camera pans that contribute further to a contrived sense of unreality. The pounding offscreen music and mannered greeting that the two marshals receive on their arrival to the island only add to an odd sense of oppressive claustrophobia even in the outdoor surroundings of the pier. Later, when the two marshals are interviewing the hospital’s staff about Solando’s disappearance, there is a bizarre sense of artificiality in the way everyone acts, as if everything is being staged for them. Soon there are additional narrative threads. Daniels is haunted by memories of his deceased wife, who died two years earlier in a fire, and of his experiences in World War II, when he participated in the liberation of the Dachau concentration camp and the ensuring massacre of German soldiers. He has nightmares of the Dachau horrors and daydreams of his wife talking to him and giving him obscure messages about his current mission. So it is clear that Daniels is not exactly mentally stable, himself. 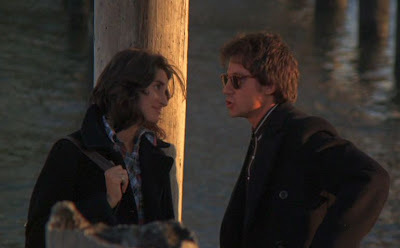 A little bit later Daniels confides to his partner Aule (whom he had only just met on the boat coming to the island) that his wife was killed in a fire set by a pyromaniac named Andrew Laeddis, whom he believes is an inmate at Ashecliffe, possibly held in the off-limits asylum Ward C. Daniels wants to find and kill Laeddis. The Daniels backstory narrative thread is obscure but obviously significant. A new, presumably more significant narrative task has now been presented: to find the antagonist Andrew Laeddis. Eventually Daniels confides to Aule that his real reason for investigating the island is a personal mission to uncover secret medical experimentation allegedly being performed on the mental patients there. He says these violations of human rights have allegedly been authorized by HUAC (the US House of Representative Committee on Un-American Activities), and they are being conducted in Ward C or at an isolated lighthouse just offshore. So now there is another narrative thread concerning the unsavory and inhumane medical experiments being conducted by a sinister and clandestine government agency. This presents another narrative goal: to uncover and deal with a new set of antagonists, the evil psychiatrist miscreants. 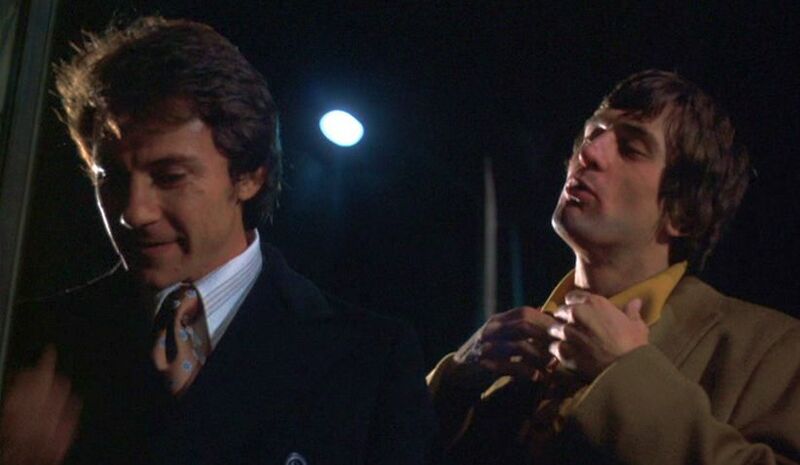 Finally, there is still another and culminating narrative explanation presented – that everything shown so far has been a sham and that Teddy Daniels is really the one who is insane. According to this narrative scheme, the preceding two hours of film have been depicting an elaborate playacting contrivance conducted as a vast psychiatric experiment in order to cure Teddy Daniels, whose real name turns out to be Andrew Laeddis, a man who killed his own wife. In this narrative, the psychiatrists are the good guys, and the narrative goal has been to cure the mental illness suffered by Daniels/Laeddis. 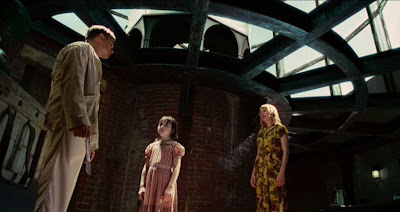 If you watch Shutter Island a second time, you will see a number of visual cues along the way that point to the authenticity of this last narrative. This may be disappointing for some viewers, because a good many people want to see psychiatrists cast in their usual roles as insidious and hypocritical villains. They can’t really be the good guys this time, can they? I like MaryAnn Johanson’s (the Flick Filosopher) response to all this: “If what I think is happening here, is happening here, it better not be.” So some people have looked for even more devious explanations as to what has happened in the film. Throughout the course of Shutter Island, the viewer is given the plot (i.e. the syuzhet) and seeks to construct the causal world surrounding that plot (i.e. the fabula). But here it can be frustrating. Likening narrative structure to travel, Kai Mikkonen sees this as constructing the map (fabula) from the itinerary (syuzhet) . But Mikkonen also stresses that as we experience the events (for example, as we pass along through a journey), the “map” is open-ended. There are all sorts of roads not taken that could have been. We are constructing the itinerary as we go. Thus the on-the-fly map/itinerary construction may be rather different from that final map/itinerary that we settle on in the end. This distinction between the on-the-fly narratives and the final narrative is what lies at the heart of Shutter Island. Confinement (before the 1930s). Procedure: lock up mentally ill people in asylums to keep them out of harm’s way, but more or less neglect them. Surgery and invasive procedures (1930s - 1950s). Procedure: subject mental patients to invasive and essentially trial-and-error surgery, such as electroconvulsive shock therapy and lobotomies. Psychotherapy (1950s - ). Psychotherapy and Psychoanalysis. Procedure: the therapist hypothesizes the existence of flawed mental structures in the mind of the patient and attempts to achieve a cure by making the patient aware of these flaws. Psycho-chemicals (1960s - ). This development has involved a push towards achieving the status of a cause-and-effect “natural science”. Based on the idea that the brain is simply a chemical structure that can be "repaired" by subjecting it to chemical treatment via drug ingestion, new pharmaceuticals were developed that were believed to cure mental illnesses. This reductionist approach has gone further in recent years to the point of assuming that psychiatric illnesses can be traced to individual genes, the detection of which via scanning can be used to see if patients are likely to suffer various disorders [2,3]. Social psychiatry (2000 - ). More recently psychiatrists, seeing the frustrating failures associated with the preceding movements, have attempted to incorporate into their treatment the consideration of sociological influences on mental conditions . Shutter Island puts us at the juncture of phases 2, 3, and 4. Convulsive electroshock therapy was on the decline at the time of the story (1954). Nevertheless, there is an indication throughout the film that Daniels/Laeddis had earlier been subjected to electroconvulsive shock therapy, although this is never explained in the film. He is shown to have a bandage over his left forehead, corresponding to where the electrodes were likely to have been placed for this therapy . Later on, after this bandage has been washed off in the shower, we can see a telltale scar on his forehead in the same spot. Lobotomies were still being performed in those days, and that is the specter that haunts Daniels/Laeddis towards the end of the film. But psychiatry was starting to take over and replace invasive surgery in the 1950s, while psycho-chemicals were just on the horizon – 1954 was the year that thorazine (chlorpromazine) was introduced. Thus in Shutter Island the psychiatrists are, surprisingly, the heroes. However, in the final scene of the film, there is a curious revelation. It was always the psychiatrists’s belief that a patient would be cured by simply generating the self-recognition on the part of the patient of his or her own obsessions and fantasies. This self-recognition would generate a miraculous cure, all by itself. 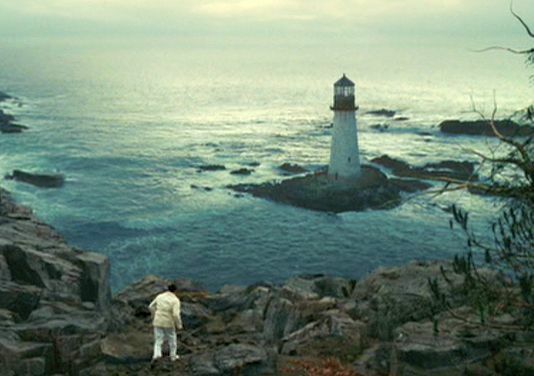 At the end of Shutter Island, however, the self-realization of Daniels/Laeddis lead to his recognition of his own monstrosity, and hence not to salvation but to self-destruction. But the public at large was right to be suspicious of professional psychiatry’s pretensions to cure mental illness. Psychiatry professor Thomas Szasz, in his book The Myth of Mental Illness (1961) , exposed the severe limitations of psychiatry, which went down the path of taking an innocent metaphor (that a person could be mentally “ill”) and attempting to attribute scientific exactitude to that term and at the same time asserting the scientific authority of its treatments. Regrettably, however, psychiatry has never been more than a pseudoscience and has failed to come to any understanding of the etiology behind mental illness [7,8,9,10,11]. So it is a disappointment and a flaw of Shutter Island for Scorsese to celebrate psychiatry. 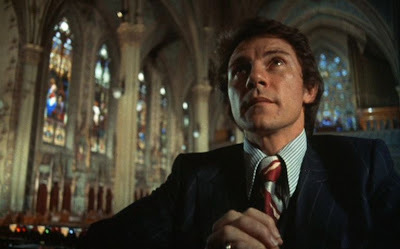 It is a flaw, too, that at the conclusion of the film, the viewer is compelled to reconstruct the entire narrative based on revelations made only near the conclusion. 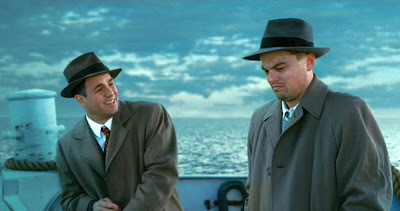 There is too much that is revealed at the end of the film, and this is a weakness of Shutter Island. Admittedly, there had been many clues that things were not quite right all the way along – the initial hypothesized narratives just didn’t add up and there was a clear suspicion that something was wrong. But, anyway, I guess that is what paranoia is all about. Mikkonen, Kai, “The ‘Narrative is Travel’ Metaphor: Between Spatial Sequence and Open Consequence” (2007), NARRATIVE, vol. 15, no. 3 (October 2007): 286-305. Poole, Stephen, “Your Brain on Pseudoscience: the Rise of Popular Neurobollocks” (2012), New Statesman, 6 September 2012. Tallis, Raymond, Aping Mankind: Neuromania, Darwinitis and the Mirsrepresentation of Humanity (2012), Acumen, Durham, UK. Lurhmann, Tanya Marie “Beyond the Brain”, The Wilson Quarterly, Summer 2012. "Electroconvulsive Therapy: Experience of Patients", (2011), Electroconvulsive Therapy, 11 August 2011, http://electroconvulsivetherapy.net/. "Brain Stimulation Therapies", (n.d.), National Institute of Mental Health, Bethesda, MD, USA. Szasz, Thomas, The Myth of Mental Illness (1961), Harper and Row, NY. Rosenhan, David L., “On Being Sane in Insane Places”, Science, 19 January 1973: Vol. 179 no. 4070 pp. 250-258, DOI: 10.1126. Scull, Andrew, “Psychiatry’s Legitimacy Crisis” (2012), Los Angeles Review of Books, August 8, 2012. Greenberg, Gary, "The Future of an Illusion", Book Forum, February 2015. "Psychoanalytic theory is the most stupendous intellectual confidence trick of the twentieth century and a terminal product as well—something akin to a dinosaur or zeppelin in the history of ideas, a vast structure of radically unsound design and with no posterity." – Sir Peter B. Medawar (Nobel Prize winner in Physiology or Medicine, 1960), The New York Review of Books (23 Jan 1975). More recently, psychotherapists have sought to counter the public's loss of confidence in their objective, technical proficiency by marketing more personal and specialized bite-sized services in the form of "life coaching". See, for example, "What Brand Is Your Therapist? ", by Lori Gottlieb, New York Times, 23 November 2012. The seemingly aimless melancholic meanderings of Wong Kar Wai (Wáng Jia-wèi) were extended into the world of gay romance with his Happy Together (Chun Guang Zha Xie, 1997). Whether this was a step forward of backward for Wong remains to be seen. Like his earlier efforts along these general lines, this film didn’t have much of a goal or clear-cut narrative movement other than to follow for awhile the sufferings of people in the throes of romantic heartbreak. Except, of course, this time we are dealing with a gay couple, which to me changes the tune somewhat. As I have commented on Wong’s earlier films in this vein, As Tears Go By (1988), Days of Being Wild (1990), Chungking Express (1993), and Fallen Angels (1995), his films generally take the viewer into a mental space that is entirely different from mainstream cinematic narratives. Rather than telling a story about people on a narrative journey that seeks out some goal(s) and usually comes to some conclusion, Wong’s films are dreamy mood pieces that seem to wander about in a lonely place. 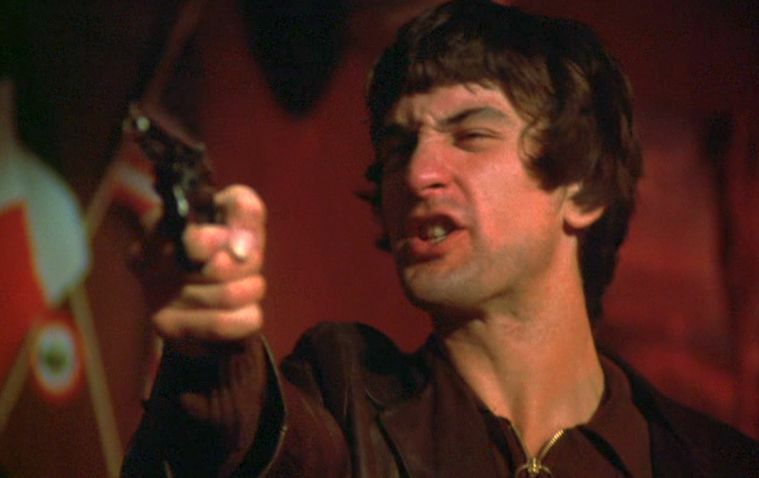 Watching one of his films is like listening to an extended flamenco guitar piece – there is movement, to be sure, but one doesn’t know where one is headed and one never seems to arrive anywhere. We do get inside some of Wong’s characters and share their romantic longing and their sense of resignation to loss. But at the same time the viewer is also aware of things from a perspective outside the scope of the protagonists – the missed opportunities, lost connections, and the utter hopelessness of the depicted romantic longings. When the film is finished, we remember not so much the events, but the mood. And it this quality of Wong’s films that make them comparable to music. The uniqueness of Wong’s cinematic style is a reflection of his production methods. Although Wong started his film career as a screenwriter, he is notorious for working without a script on his own films and making things up as he goes along. In other words the aimlessness of his films reflect the apparent aimlessness of Wong’s filmmaking style. Nevertheless, Wong Kar Wai has a devoted following, including that of serious film theorists and critics. There are roughly two lines that people take with respect to Wong’s narrative style. On the one hand, one could say that Wong is exploring new pathways in the area of cinematic expression. The idea is that rather than simply translate some narrative text into the film medium, Wong is actually showing us that cinema has a vastly greater space and opportunities for dynamic visual expressiveness and tone. According to this line of thinking, the narrative is always exclusively embodied in the medium (film/text). Wong Kar Wai is then seen as pushing the boundaries of narrative and is exposing conventional filmmaking as restricted and old-fashioned. Another point of view concerning Wong would not attribute an entirely new form of visual narrative to his work. Instead, one would say, following along the lines I believe of David Bordwell, that Wong is simply taking advantage of the audience’s by-now rather sophisticated capabilities of mentally constructing a narrative. According to this line of thinking, the viewer is always the co-constructor of any narrative. He or she inevitably must fill in the missing information and gaps of what is told and imagine the activities and events based on his or her own past experiences that flesh out the story. Thus narrative is not just embodied by the “text”, but in fact encompasses three items: the teller (creator/sender/narrator), the narrative message (film/text), and the listener (viewer/receiver). So Wong Kar Wai, from this perspective, is not doing anything really radically new, but is instead just providing only (narrative-message) bits and pieces and is thereby leaving more narrative gaps to be filed in by the spectator from his or her own romantic recollections. This forces the viewer to take a more active narrative construction role. I subscribe to the second, call it “Bordwellian”, view of narrative and Wong Kar Wai, but that perspective doesn’t diminish my appreciation of Wong’s films. Despite the apparent aimlessness of his filmmaking style, there is certainly some method to his madness that enables him to keep producing interesting cinematic experiences. Nevertheless, Happy Together, despite earning for Wong Kar Wai the Best Director award at the 1997 Cannes Film Festival and receiving high praise from some respected quarters , wasn’t for me one of those satisfying experiences. Perhaps contemplating some of its shortcoming can reveal a bit about what makes Wong’s other films work so well and why this one didn't. The story concerns two gay men from Hong Kong who have traveled to the “other end of the earth”, in this case to Buenos Aires , in hopes of rekindling their on-again/off-again relationship. As usual, Wong has cast top Cantopop music and cinema performers in the leading roles, in this case Leslie Cheung and Tony Leung Chiu-Wai, as the two gay lovers. And as usual with Wong Kar Wai’s films, nothing much seems to happen. The first twenty or so minutes of the film are in black-and-white and outline the dysfunctional romantic relationship between the two main characters. Ho Po-Wing (Leslie Cheung) is the extrovert – a spoiled, self-absorbed narcissist who continually avoids responsibility and seeks to charm his way through all circumstances. His lover, Lai Yiu-Fai (Tony Leung Chiu-Wai), is the introvert and is more responsible, sensitive, and caring. 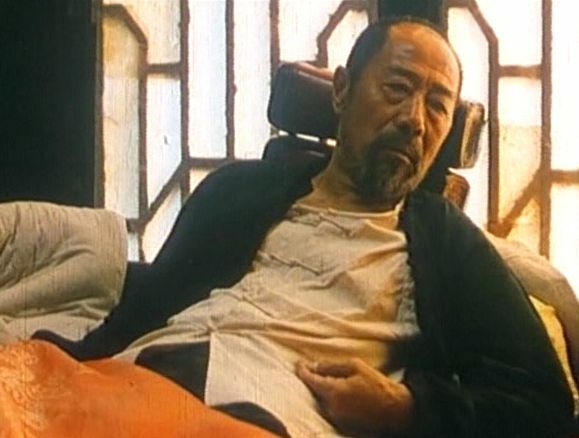 For most of the film, the focalization is on Lai, and the viewer is privy to Lai’s inner monologue describing his emotional responses and reflections. The film’s story, reflected by voiceover narration, seems to be that of a memoire – a recollection of the meaningful moments that have taken place sometime in the past. And like all recollections, seemingly random moments and images are magnified and elongated in time. The two men have a stated goal of eventually making a trip to the famous Iguazu Falls about a thousand kilometers north of the city. And this goal has metaphorical overtones for the story. For the two men, this goal is almost an unrealizable fantasy, and the closest they seem to be able to get to is to stare at a rotating frosted souvenir lamp depicting the falls in Lai’s apartment. But neither of them has much money. We later learn that for them even to get to Argentina, Lai stole money from his father. Now he lands a job as a greeter at a Buenos Aires tango bar to provide some support. Ho just lives off Lai whenever he needs money, but he also continually drifts away into other male liaisons and appears to be more or less a male prostitute. The relationship of the two men is persistently rocky. Ho is habitually petulant and demanding, so naturally Lai constantly gets fed up with Ho’s selfish behaviour. But at the same time Lai can’t resist Ho’s coquettish charm, and he continually melts and gives in to whatever demands Ho makes. After one of their separations, Ho shows up at Lai’s apartment beaten up after some unexplained nocturnal escapade and has to be taken to the hospital. Ho’s hands are left all bandaged up, and he must be waited on and spoon-fed (chopsticks-fed) by Lai. Although Ho is now more petulant and demanding than ever, Lai reflects in voiceover that Ho’s helpless dependency on Lai make this his happiest period with Ho. It was then that they were truly happy together, and accordingly the film presentation suddenly shifts from black-and-white to color. 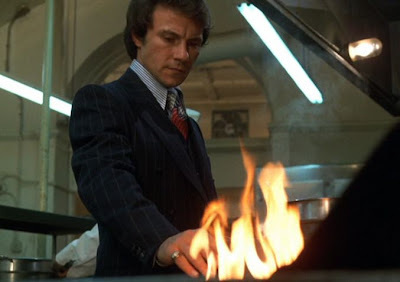 After some time (about forty minutes into the film) Lai takes a job working in a restaurant kitchen. One of his coworkers is a Taiwanese expatriate, Chang (Chang Chen), who casually befriends Lai. Meanwhile the Lai-Ho relationship is going through ever-worsening ups and downs, finally leading Lai to despair. After coming to the conclusion that he can’t go on with it anymore, Lai is heartbroken, and he spends time with Chang to get his mind off Ho. The focalization and narrative voiceover, which up to this point had been exclusively associated with Lai, now occasionally shifts to Chang, with Chang’s voiceover reflections about Lai. Chang, incidentally, is almost the opposite of Ho. Rather than focusing on his own self and image, Chang is a serious listener of other people – so serious, he tells Lai, that he can discern other people’s inner emotional states just by listening to them. And so he likes to eavesdrop all the time on Lai’s conversations whenever he is in the vicinity. We never really learn if Chang is gay or not, but there is clearly an affinity between Lai and Chang that slowly develops over the rest of the story. Eventually Chang departs for a trip to the southern tip of Argentina, perhaps, it is hinted, to try and rid himself of his own sad memories. Lai manages to save up enough money to afford a trip back to Hong Kong; but before he leaves, he makes that promised visit to the Iguazu Falls. 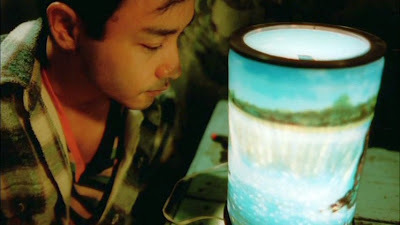 While Lai seeks to re-engage with the real world by visiting the real falls, Ho is shown moving back into Lai’s old apartment and staring dejectedly at the souvenir lamp depicting a crude artificial image of the falls. On his return trip to China, Lai has a stopover in Taiwan, and though Chang is absent, Lai visits Chang’s family street market café in Taipei. While there, he spies a picture of Chang at the back counter and steals it for future reference. . There are several reasons, to me, why this story never really gets into gear. One problem with Happy Together is the excessive and mundane repetitiveness of the Ho-Lai interactions. They don’t even convey a hint of progression. 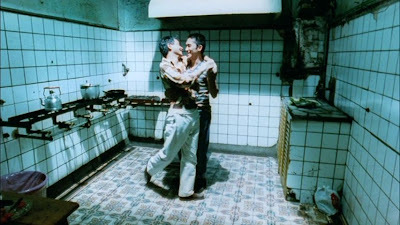 Perhaps this was Wong Kar Wai’s intent – to convey the idea that the relationship wasn’t going anywhere – but depicting tedium in a film is always a losing proposition. Wong got around this kind of problem in his earlier films by effectively telling two shorter stories, either sequentially or in parallel, so that we did not wear out one story over the routine running time of a feature film. It is true that there is also the Chang-Lai story in this film, but it’s too inconsequential to give the viewer relief from the tedium of the Ho-Lai story. Another difficulty with the film is the cinematography from Christopher Doyle, whose previous work for Wong Kar Wai and elsewhere has been superb. As usual with Doyle, there are the overt temporal-flow variations, as well as the deliriously moving camera shots, but they all seem more mechanical on this occasion. Moreover, the switching back and forth from black-and-white to color seems artificial and pointless. And the excessive contrast in many of the shots often leaves darker portions of the images clouded in blackness. This excessive contrast seems to be intentional, but why? For example, there are several sequences showing Lai and Chang playing soccer in a back street with some mates. For these sequences, the camera is aimed directly into the sun, whose brightness leaves all the players indistinctly dark. Although this visual effect does perhaps evoke a memory of looking into the sun on some occasion, there doesn’t seem to be any point to these shots, and so they stand out as oddities while the viewer struggles to make out what is going on in the frame. Maybe the most fundamental issue with the film is the almost total absence of women. 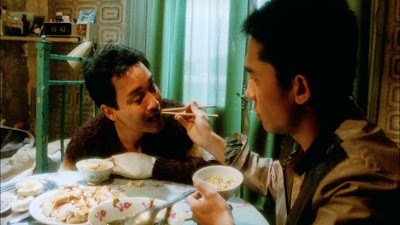 Although Wong Kar Wai insisted that Happy Together was simply a story about two people relating to each other and was not a gay film, in fact the missing feminine component in the film compromises his aesthetic virtues. The opening images orient the viewer quickly about this matter, showing an extended scene of two naked men in bed aggressively making love. Of course I recognize that your mileage may vary on this, but I would say some of Wong Kar Wai’s best moments in his previous films involve images of beautiful, passionately heartbroken women who yearn after unresponsive men. These images are not from a woman’s perspective: they strike me as images of male fantasy and are seen from an external male point of view. It’s the mysterious feminine allure of romantic longing as seen by men. 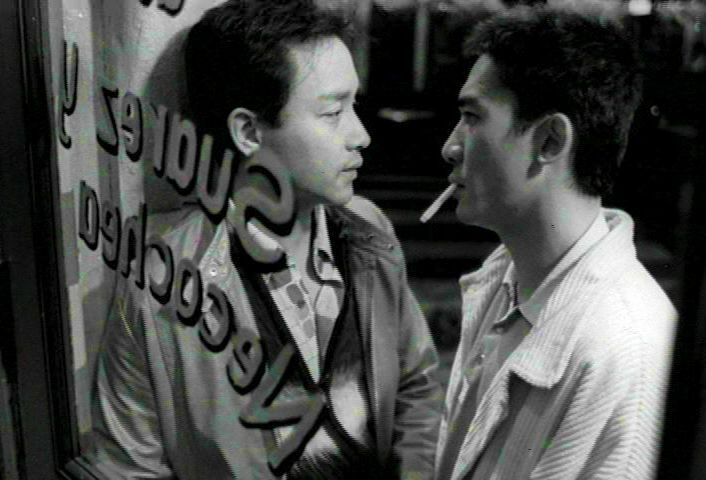 But despite admirable performances by Leslie Cheung and Tony Leung Chiu-Wai in Happy Together, this romantic-emotional effect isn’t achieved (at least for me) in this film. That is, the corresponding sensibility – Wong’s previously presented sensibility but shifted over to this film’s relational context – is not achieved here. Leslie Cheung, just as he was in Days of Being Wild, is the self-absorbed narcissist; but on this occasion the sense of longing for him is seen from an internal perspective (that of Lai Yiu-Fai) – and this is not the male-fantasy-fueled external experience of those earlier Wong films. Even if the Ho Po-Wing character had been fashioned as a woman in the film, this internal/external difference in perspective (i.e. difference from Wong’s earlier films) would have remained. By abandoning that earlier romantic fantasy sensibility, Wong has lost something here. Never mind, Wong Kar Wai would take a step back in the right direction with his next film, In the Mood for Love (2000). Kraicer, Shelly (1997), “Happy Together”, A Chinese Cinema Web Site, http://chinesecinemas.org/happy.html. 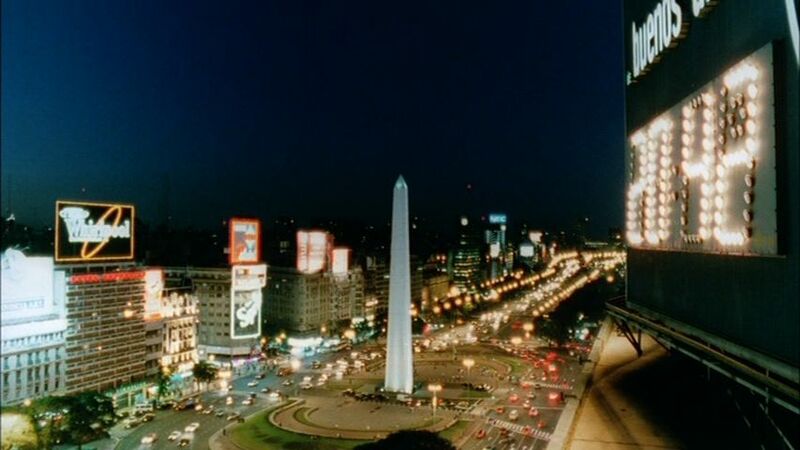 Buenos Aires is practically at an antipodean position with respect to Hong Kong. 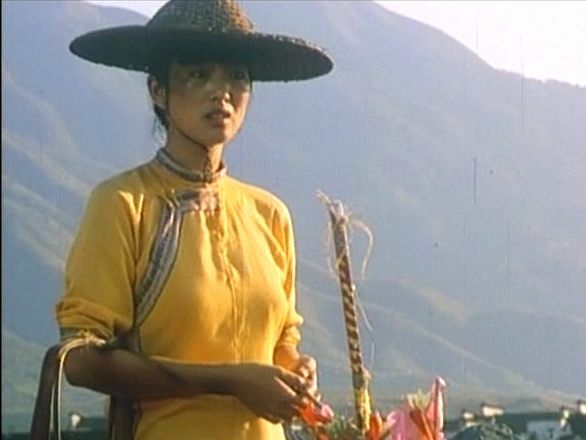 Ju Dou (1990), Zhang Yimou’s third directorial outing, is, to my mind, not only his breakthrough film but also a work that ranks at the top of his cinematic oeuvre. Although the film, like the preceding Codename: Cougar (Daihao Meizhoubao, 1989), is listed as co-directed by both Zhang and Yang Fenglian, this work has the earmarks of Zhang’s strikingly expressionistic visual artistry. 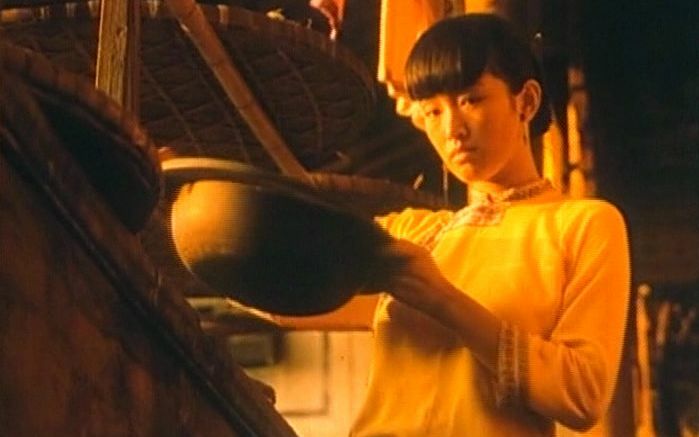 This film was also the third of what would be seven successive Zhang productions that starring his personal and artistic partner at the time, Gong Li. The film’s story concerns a narrative theme of universal interest, but it was presumably one rarely touched upon (at least up to that time) in the conservative Chinese social atmosphere: that of illicit sexual passions in a provincial town. 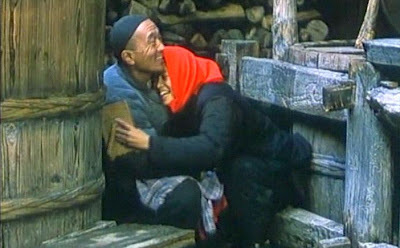 As such, although the film was immediately hailed abroad and was nominated for a US Academy Award as Best Foreign Language Film (1990), it was initially banned for several years in China. The film is set in the early 20th century and opens with Yang Tianqing, a “nearly 40-years-old” nephew of an elderly textile dyer, Yang Jinshan, returning to the uncle’s dye mill from a three-month trip selling the mill’s products in other cities. He learns that while he was away his uncle has bought himself a new wife, named Ju Dou. This is the way it was traditionally done -- a man had to have enough money to be able to buy a wife, and Tianqing, who works as a humble servant for his uncle Jinshan, is too poor to be able to afford a wife. Jinshan and Ju Dou live upstairs in the mill, while Tianqing occupies a downstairs room. The stingy Jinshan insists that all the drudgery-filled millwork must be performed by just the three of them quartered at the mill, without assistance from any paid workers. It is soon evident that Jinshan is not only a stingy skinflint, but also a perverted sadist who is said to have tortured his two previous wives to death for not providing him with a son to continue the family name. With the beautiful young Ju Dou he continues his vile domestic ways, and he is seen placing a saddle over her prostrate torso so that he can “ride” and whip her as if she were a beast. “If I buy a beast, can I not ride or beat it at my pleasure?,” he asks her rhetorically. At night the timid Tianqing hears Ju Dou’s tormented moans from Jinshan’s molestations, but he is powerless to intervene. He can’t get the luscious beauty out of his mind, though, and he can’t keep himself from spying on her through a peephole while she is bathing. One day after returning from another trip to buy materials for the mill, Tianqing encounters Ju Dou on the road and shows concern for the scars he sees on her face and arms. Ju Dou tries to dismiss his concerns, but she also craves sympathy suffering though an unbearable life with Jinshan. After accidentally discovering Tianqing’s peephole, she realizes that her personal bathing has an admiring audience, and she boldly exposes her bruised backside to him the next time she bathes. Going further, she reaches out to him when they are working alone together in the mill and plaintively complains about her miserable condition, explaining that she has no hope of avoiding the fate of the two previous wives since Jinshan is sexually impotent and she will inevitably also be accused of failing to produce a male heir. Soon, when Jinshan is away from the mill for a few days attending to the care of his sick donkey, Ju Dou makes the decisive move and approaches Tianqing lustfully, offering herself to her timid admirer. They begin a torrid love affair, and not long afterwards Ju Dou finds herself pregnant. In due course the baby, named Tianbai, is born, and Jinshan, apparently ignorant of basic biological facts, assumes that he is the father of Ju Dou’s child. Ju Dou and Tianqing continue their affair in secret, but soon an unexpected event changes their circumstances dramatically. While out on the road one day, Jinshan suffers an accident that leaves him paralyzed from the waist down. With Jinshan now helplessly dependent, Ju Dou and Tianqing have the power to operate more freely, at least within the confines and behind the closed doors of the mill. They now openly reveal to Jinshan their passionate love affair and the fact that Tianbai is in fact the son of Tianqing. In public, though, Ju Dou and Tianqing dutifully attend to the crippled Jinshan, who is now almost their prisoner and confined to a wheeled basket. Presumably to avoid losing face, Jinshan remains silent in public about his situation, but one can see that he is sullenly bent on revenge. 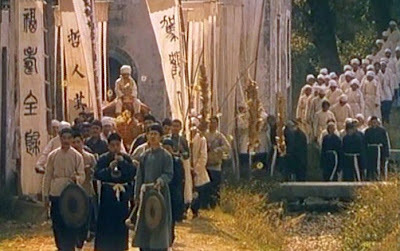 Throughout this section of the film, the viewer sees more and more evidence of the suffocating Confucian pressures of conservative village society. Ju Dou must still appear in public to be the dedicated selfless wife of the loathsome Jinshan, whose “son” is the only legal male heir to the extended Yang clan. So later when she misses her monthly period, she panics, knowing that another pregnancy would be disastrously received by the nosey townspeople. To avert that possibility, she seeks out purgative home remedies and treatments, which turn out to be torturously painful and wind up leaving her infertile. Meanwhile as time passes, Jinshan makes several unsuccessful attempts to kill Tianbai in revenge, but he changes his mind when he joyfully discovers that the now three-year-old boy mistakenly thinks that Jinshan is his father. Now instead of wanting to punish Ju Dou by killing the child, he strives to claim the lad as his own and alienate him from his mother. Ju Dou detests Jinshan and would like to be free from him, but she and Tianqing are still prisoners of the restrictive Chinese social customs that require them to remain attendant to the old man. While Ju Dou and Tianqing are out one day, Tianbai accidentally causes Jinshan’s wheeled cart to tumble into the dyeing vat, and the boy watches mirthfully while Jinshan thrashes about in the water and finally drowns. 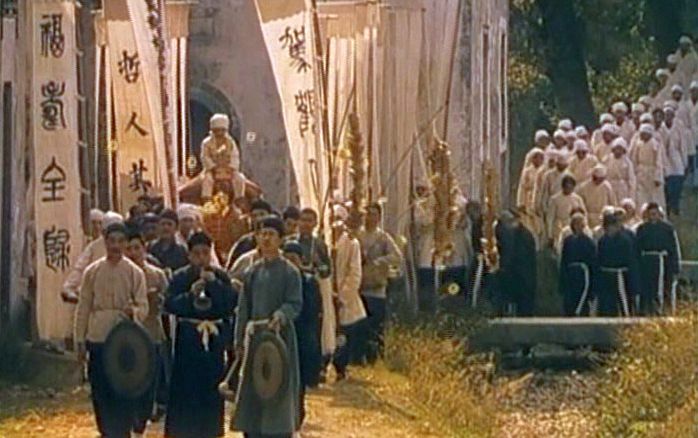 The ensuing funeral for Jinshan follows strict traditional customs and is filled with absurd rituals that compel Ju Dou to engage in extravagant public acts of grieving. Afterwards, Tianqing is ordered by the family elders to cease living at the mill, since it is now an abode where only a widow resides. Under these conditions the secret trysts between Ju Dou and Tianqing become extremely difficult to arrange, and there are long periods when the two lovers are apart. There is now a gap indicating a further passage of about seven years, and Tianbai has grown to be a sullen and insubordinate teenager. When he overhears some meddlesome villagers gossip naughtily about Ju Dou and Tianqing, the obstreperous boy rushes out to bash Tianqing. Later the two lovers have what they fear may be their last tryst down in the mill’s dusty storage cellar. After some blissful moments together, they both pass out from exhaustion and lack of oxygen . Tianbai eventually discovers the two prostrate lovers in the cellar and proceeds to kill his own father, while Ju Dou helplessly watches in aguish. The final shots of the film show Ju Dou setting fire to the dye mill that has long been her prison. She watches passively as the flames gradually surround her and engulf the mill. With such a melodramatic plot, you may wonder why I hold this film in such high esteem. There are several answers to be given on this score, but first I will mention the film’s extraordinary visual presentation. While the subject matter suggests the dark, somber overtones of film noir, Zhang uses the story’s context of bright color cloth production to drape the film in a dramatic spectrum of hues that imbue the film with a pervasive current of vitality. The colors here play a corresponding, though not exactly equivalent, role that dark shade and darkness play in more conventional films noir. 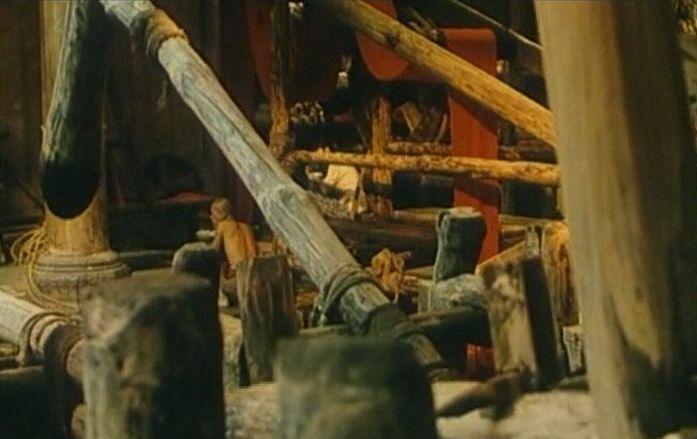 Such expressionistic use of coloring had been seen in 1950s Hollywood films with Technicolor, and it is no accident that Ju Dou has similar color aesthetics. Technicolor Corporation’s elaborate three-strip coloring process had gone out of favor in the 1970s, and their dye transfer plants were sold off, with one of them eventually being shipped to Beijing and available for Zhang’s use. So if you are fortunate enough to see Ju Dou at a theatrical screening, you will probably find the visual experience unforgettable. Unfortunately, existing available DVDs of Ju Dou are, at least to my knowledge, miserable failures as transfers of the original film prints to the digital medium. 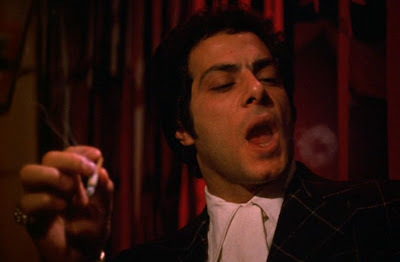 The lush colors of the original film are often washed out and faded in the DVD versions, and the contrast range is so reduced, that darker portions of the image are often lost in blackness. In addition the frames of DVD versions appear to have been severely cropped and sometimes cut off meaningful imagery. 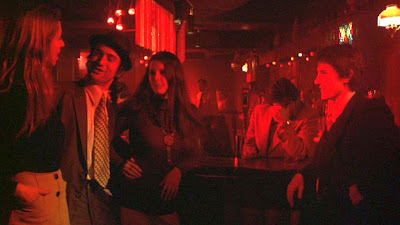 Nevertheless even if you see one of these visually diminished DVD versions, the film is so vibrant that you may still get a feeling for what the original film was like. I am not suggesting here that Zhang is morally endorsing the extra-marital relationships shown in Ju Dou, but there is nevertheless a clear sympathy expressed for the authentic individual feelings of the protagonists in Ju Dou. And this sympathy for genuine feelings and human interaction is somewhat different from the conventional Communist celebration of the moral virtues of the working class. In those traditional Communist panegyrics, the working class is usually visualized in the abstract, as a heroic prototype. In contrast to those kinds of Communist government sponsored propaganda efforts, Zhang’s films – at least after his more orthodoxly-tinged Red Sorghum (1989) – feature protagonists who are simple, straightforward individuals, capable of personalized and heart-felt passions and compassion. Moreover, this soulful combination of compassion and passion is stunningly embodied by Gong Li, in the title role. 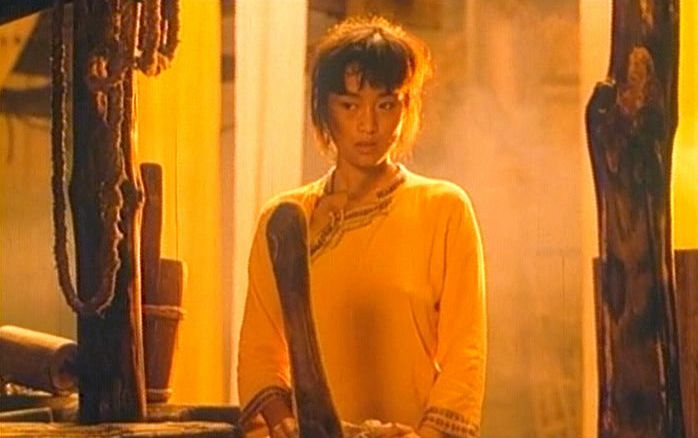 I have remarked on the mystique of Gong Li before – see my comments concerning her performances in Raise the Red Lantern (1991), To Live (1994), and Shanghai Triad (1995). There is a natural grace to her movements that conveys both passion and innocence, both openness and commitment, at the same time. And this is accomplished in natural social contexts of ordinary Chinese society. This is a rare kind of beauty that is not captured in a still photograph. You need to see her perform in action, in those ordinary but dramatic contexts in which her role is cast. This leads to the implicit notion underlying the film’s narrative that a society grounded on authentic and compassion-based intuition is superior to one governed by artificial and unbreakable rules that have lost all touch with human reality. It is perhaps this implicit social judgement in the background of the film that unnerved the Chinese authorities more than any explicit references to individual sexual passion in Ju Dou. The film seems to ask: if the conservative Confucian-based rules of Chinese society are there to preserve social stability and order, then why does this social structure permit, and even endorse, the kind of perfidy committed by the sadistic Yang Jinshan, or Tianbai, for that matter? Actually, this brings me to the separate thematic subject of the character of Ju Dou’s son, Tianbai. There is something horrifying and unnatural about this boy. In his abrupt, brutish physical movements, he conveys an injurious malevolence that is the very opposite of the heartfelt humanity presented by Ju Dou and Tianqing. Is there a symbolic significance to his character? He is the biological offspring of Ju Dou and Tianqing and was raised by Ju Dou, but he hasn’t inherited their virtues. What accounts for his cold-blooded, reptilian savagery? 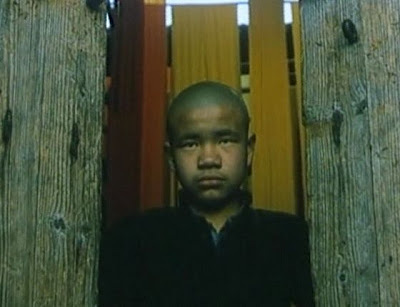 Perhaps while Ju Dou and Tianqing were busy working in the dye mill, he was manipulated and twisted by the malicious Jinshan, who was idly resident in the dwelling and free to twist the boy in the wrong direction. Some commentators have suggested that Tianbai represents the brutality of the Cultural Revolution’s youthful Red Guards, or more generally the ruthlessness of the darker aspects of Maoism. But I think that his visage is even more visceral and primitive than those social phenomena. To me he represents a dark animal force that is always present in any social surroundings. It is the ever-present dark savagery of the carnivore that civilized society must seek to tame. 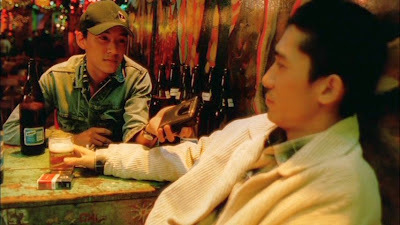 Zhang Yimou would later venture more overtly into the film noir genre with works like Shanghai Triad and A Simple Noodle Story (aka A Woman, a Gun and a Noodle Shop, 2009), films with moods and feelings distinctly different from the one presently under discussion. In Ju Dou there is a mixture of moods: in addition to the dark external atmosphere of a noirish environment, there is the interior, personal world of individual striving. The film ends that story on a note of defeat and destruction. But there is also dark beauty in this film, even in these lurid surroundings. It is that expressionistic undertone of beauty that lingers in the mind long afterwards. 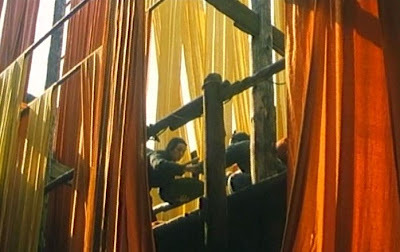 This is a scene that may evoke memories of Wu Tianming’s film Old Well (1986), which incidentally featured an award-winning acting performance by Zhang Yimou! Lu, Sheldon H. (2005),“Chinese Film Culture at the End of the Twentieth Century”, Chinese-Language Film: Historiography, Poetics, Politics, Sheldon H. Lu & Emilie Yueh-Yu Yeh (eds. ), University of Hawaii Press, pp. 123-24.